Windows Phone 7.5 Mango has started to roll out for everyone as we speak, but there’s one problem: You have to wait for a considerable period of time before the said update hits your Windows Phone powered handset. How about we turn the tables and hook you up with Mango right now? Complete instructions after the break. The method which we’ve jot down below forces the Mango update on to your handset, therefore you need to be careful about a lot of things. Make sure your Windows Phone device is updated to the latest NoDo build, otherwise you won’t be able to install the Mango update. Simply plug in your handset to your Windows driven PC, launch Zune software, click on “phone” on the top of the screen, then click on “SETTINGS” then click “UPDATE”, you should be notified for an update already if you don’t have NoDo installed. If you already have NoDo installed and you still see an update, then its highly likely that it’s the post-NoDo update which prepares your handset for Mango. If that is the case then simply hit update button and you’ll be running Mango in a matter of few minutes. 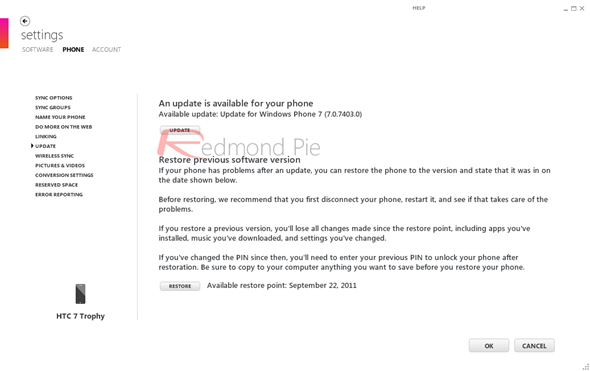 But if you don’t see the update at all then follow the guide posted below on how to force Mango on your Windows Phone handset. Note: Before you begin, I highly recommend that you read the guide first thoroughly so you know exactly what you’re going to do. Do not in any case remove the USB cable throughout the process and make sure your PC is also fully charged and is running on AC power, just to be on the safe side. Disclaimer: Redmond Pie will not be held responsible in case something does go wrong in between the process, which may include the loss of data or bricking of your device. Step 1: Make sure your handset is fully charged, although 50% battery would do, but it is always better to be safe than sorry. Step 3: Plug in your Windows Phone device to your PC via the provided USB cable. Step 4: Zune should now automatically launch once your handset is plugged in. Click on “phone”, then click on “SETTINGS” and then click on “UPDATE”. If you’re on the latest build of NoDo, you’ll be informed that your handset is up to date and there’s no update available yet. Step 5: This step is the trickiest one and timing is crucial, therefore proceed carefully. Repeat Step 4, and when you hit the “UPDATE” tab, immediately disconnect your PC from the internet, which means turn off WiFi or remove the Ethernet cable through which you’re connected to the internet. Step 6: If you performed Step 5 properly, then after about 30 seconds Zune will tell you that a software update is available for your handset. Don’t see the update? Repeat Step 5 again until you do see an update. 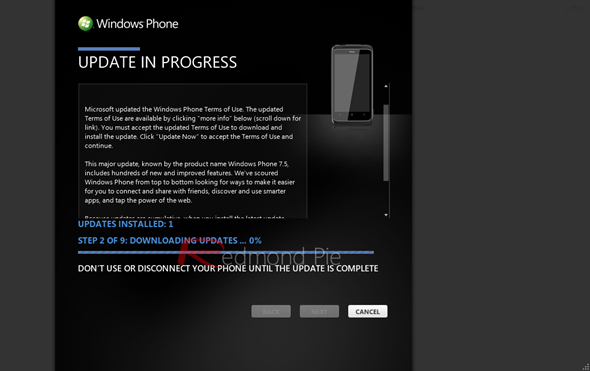 if you do see the update as shown in the screenshot below, then move to Step 7. Step 7: Connect to the internet again and hit the “UPDATE” button. Step 8: Simply follow the on-screen instructions and the update will install without a hitch. 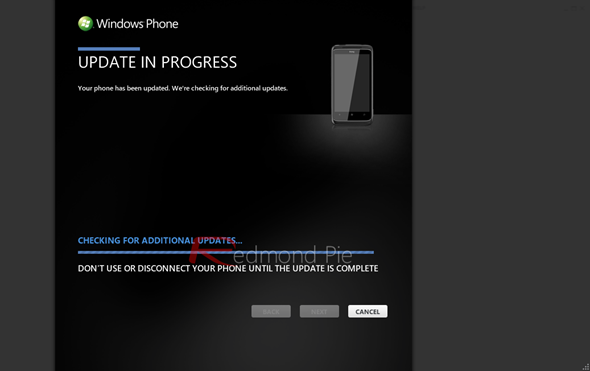 Step 9: Once you are done installing the first update, Zune will automatically search for more updates. Step 10: Don’t see any additional update? Repeat Step 5. If you do see the update, then simply follow the on-screen instructions for installation. Step 11: The process is going to take a handsome amount of time, therefore be patient and do not in any case disconnect your device from your PC. Grabbing a coffee or watching an episode of your favorite show to kill some time is highly recommended at this point. 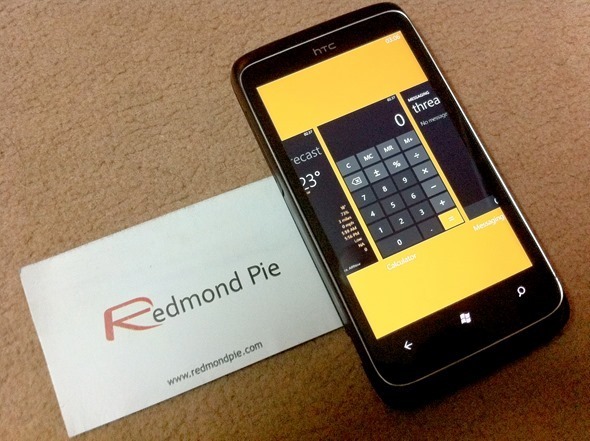 Step 12: Once the process is complete, you’ll boot into Windows Phone 7.5 Mango! Hats off to the folks over at WPCentral for sharing this method with everyone and blessing every user with Mango way before it gets pushed to you naturally. 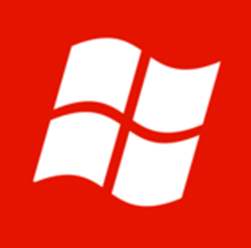 Windows Phone 7.5 Mango is a major update for Windows Phone devices and it brings tons of features on the table which takes the Windows Phone experience to a whole new level. 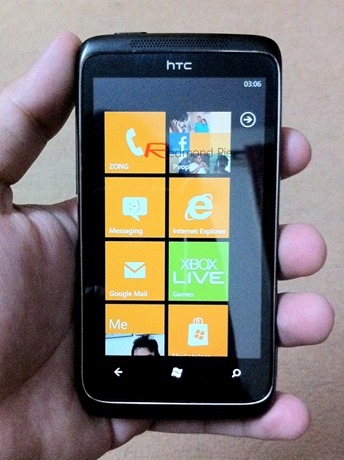 Having played around with Mango for an hour now (at the time of writing), I can assure that our HTC 7 Trophy is screaming in terms of performance! Its really snappy, multitasking is a bliss, the People’s hub is way more awesome than before. 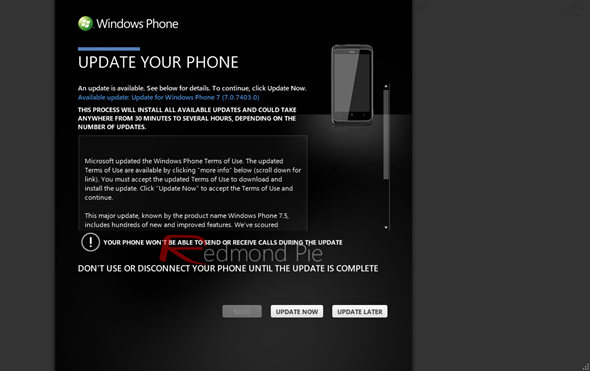 With all these features on board, there’s no excuse for not updating your handset to Windows Phone Mango at this very moment.